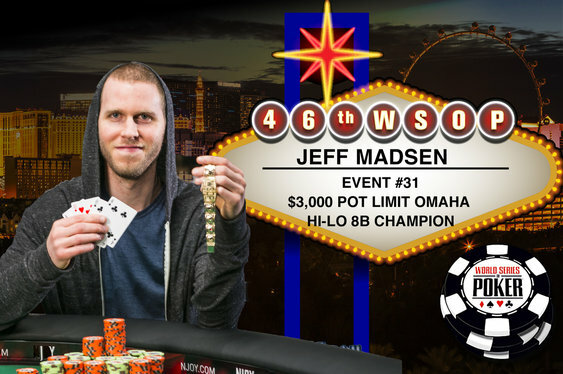 Jeff Madsen enjoyed a late birthday bonus after winning his fourth World Series of Poker (WSOP) bracelet on Wednesday. The American pro entered his 30s just a week ago and marked the occasion in style by topping a quality 480-runner field in the $3k PLO Hi-Lo Championship event. Madsen pocketed a first prize of $301,314 after working his way through a final table that included David 'ODB' Baker and Ireland's John O'Shea. Earning a fourth WSOP bracelet at such a tender age puts Madsen in some pretty elite company. Only Phil Hellmuth, Allen Cunningham and Stu Ungar had managed to bag a quartet of bracelets before they'd reached thirty. The latest win takes his WSOP earning up to an impressive $2,650,499.